Giant, buttery, sugary cookies have a time and a place but sometimes you want something that’s a little more reasonable to eat every day. 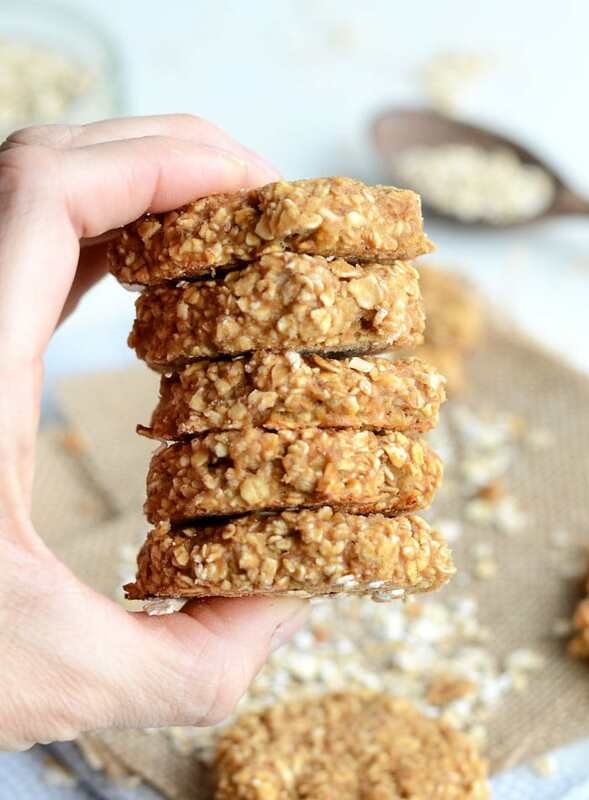 These healthy peanut butter oatmeal cookies are just 75 calories each and are a great way to satisfy a cookie craving without going overboard on sugar and fat. So, let’s see what these little delights have to offer..
To make these peanut butter cookies low in fat, I used powdered peanut butter instead of regular peanut butter. Powdered peanut butter is essentially peanuts have have been pressed to remove much of the oil and fats. This leaves the taste but reduces the fat and calories, leaving you with a peanut powder that can be reconstituted in water. Peanut butter is more or less my favourite food but since I’m tracking macros right now it’s pretty hard to include much of it in my diet. In comes P2B, one serving provides just 45 calories with 5 grams of carbs, 5 grams a protein and 1 gram of fat. Sounds to good to be true, right? Well, it kind of is..lol…it’s by no means real peanut butter but it gets me by and I think it’s a good ingredient to have on hand for peanut butter snack attacks. I often use it as a replacement for peanut butter, especially in sauces, and I also just mix it with water to eat as a spread or dip. These (key word: low fat) cookies definitely taste like they’re healthy. I mean, you can only ask so much from 75 calories!! These are not a big, beautiful, decadent peanut butter oatmeal cookies however, those big, beautiful, decadent peanut butter oatmeal cookies can be upwards of 400 calories each, so they’re not something I include in my diet on a daily basis. I wish. That being said, these are enough of a treat to satisfy my sweet tooth and cookie cravings. You can always add dairy-free chocolate chips if you want them to feel a bit more like dessert! 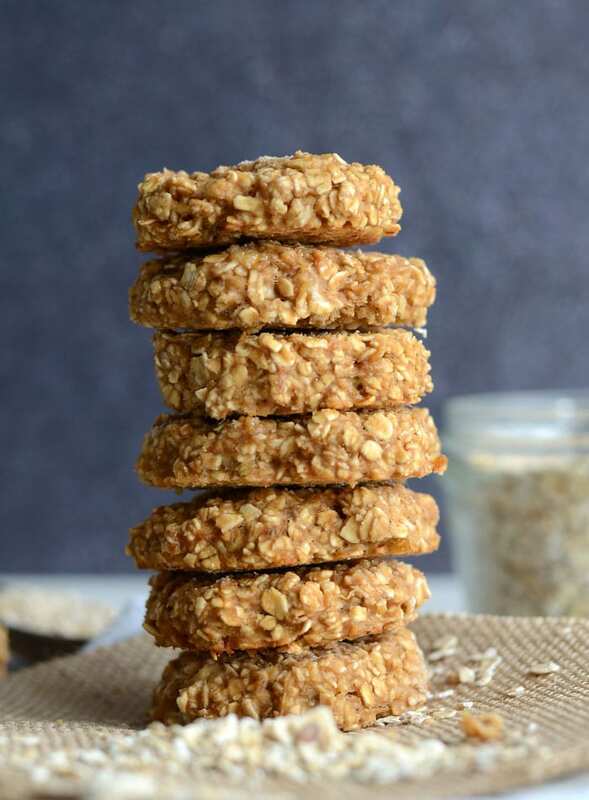 I sometimes make these cookies with just oats and banana. If you’d like to try that, all you need are 3 bananas and 2 cups of oats. Mash the bananas, stir in the oats and bake for around 10 minutes at 350. Today, I felt like an extra special version of those so in went powdered peanut butter for a low fat version of my Flourless Peanut Butter Banana Oatmeal Cookies. Try different combos and see what you can come up with! You can get creative with other add-ins too. How about pumpkin puree with cinnamon and walnut, or grated carrot with nutmeg and ginger, or chopped pecans and raisins. Anything goes! 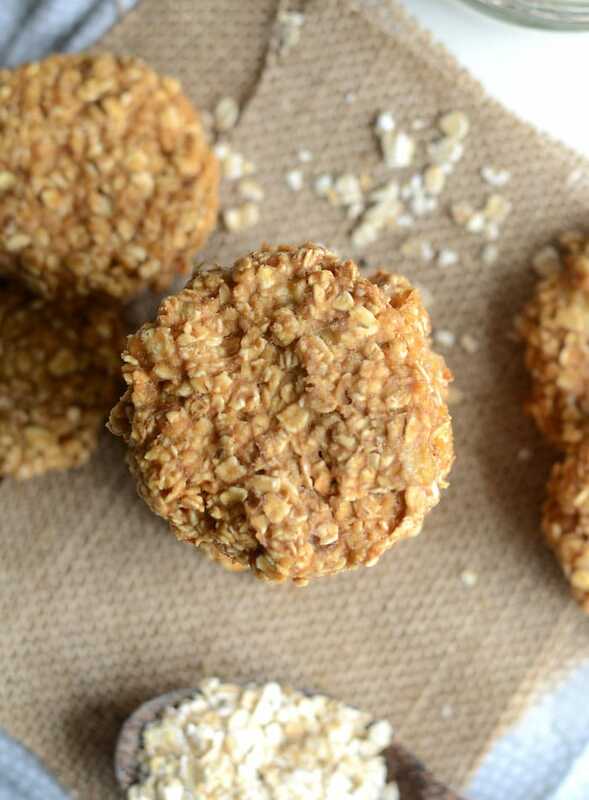 These simple, low fat peanut butter oatmeal cookies require just 4 simple ingredients. By using powdered peanut butter instead of regular peanut butter, each cookie is just 75 calories! 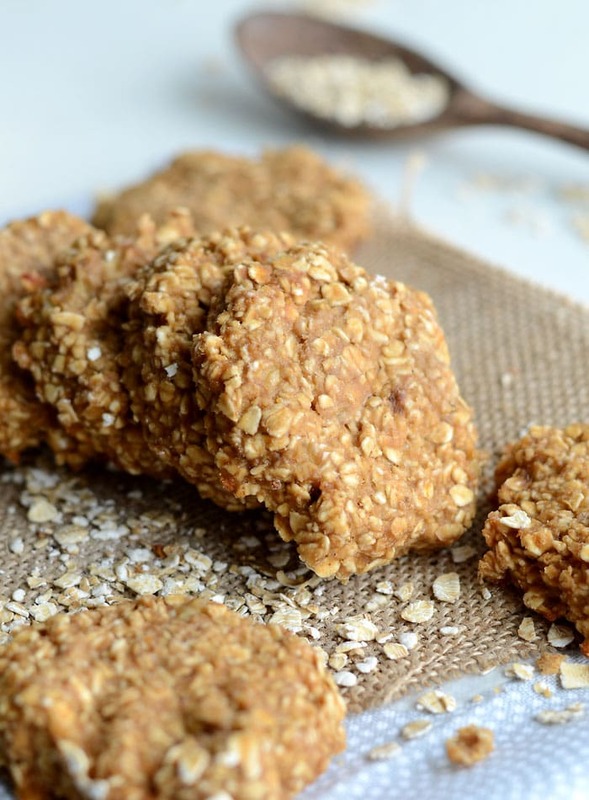 Satisfy your next cookie craving with these tasty, wholesome little treats. Place the mashed bananas in a bowl and stir in the applesauce to combine. Add the oats, powdered peanut butter and salt. Mix well. Prepare a baking tray with parchment paper or a silicone baking mat, or very lightly spray with non-stick cooking spay. Drop 12 spoonfuls of the dough onto the baking tray, pressing down a bit to form cookies. Bake for 16 minutes until golden brown, do not overcook. If they seem slightly underdone when you take them out, that’s about right. Let cool on the pan. The banana can substituted with additional apple sauce, mashed sweet potato or pumpkin puree. Alternatively, the applesauce can be substituted with additional banana. These cookies are pretty flexible so play around and find a combination that works for you! I added a few drops of liquid stevia for extra sweetness but they’re still quite sweet without it so it’s totally optional. Powdered stevia also works if you don’t have drops, just taste the batter and adjust the sweetness from there. The sweetness will also depend on how ripe your bananas are, the riper the banana, the sweeter the cookie! I love Stevia-sweetened dark chocolate that’s completely dairy free, as well as the Endangered Species dark chocolate that comes in various flavors! PB2 is absolutely amazing too–they need to make a powdered almond butter too 🙂 these cookies look so so good, and I love that they’re so macro-friendly! 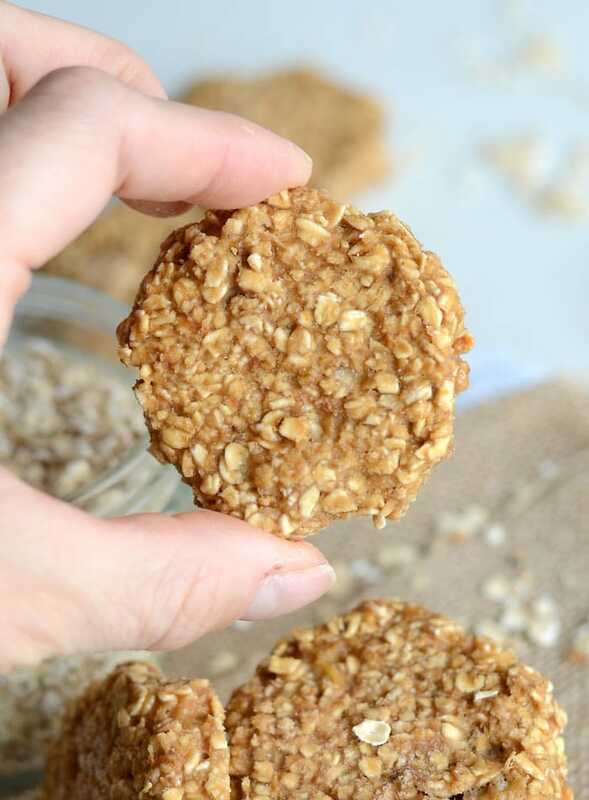 Can you make these cookies with almond flour instead of oatmeal & would it still be 2 cups if you did switch out the oatmeal for the almond flour? Hi Roberta, I’m sorry I’m not too sure how they would work with almond flour but I think it would probably be okay! I can’t say exactly what quantity you would need though. Let me know if you try it. I made a modified version of this! I used 283g (3 small) bananas, 82g quick oats, 4 tbsp PB2, and 12g colorful sprinkles (will add just on top next time). Baked at 350* for 15 min, made 12 cookies. Each cookie is 1.9p/11.7c/0.8f/1.6 fiber. Thanks so much for the inspiration! Mine are a little more soft/gooey than a cookie bc I had more banana. Still a great, clean way to satisfy a sweet craving! Hi, Can I substitute regular for quick oats? Yes, that will be fine. Enjoy! I chilled the dough one hr before baking and the cookies were easier to form and baked without melting into a flatter circle during the oven time. They are delicious and who doesnt love a toasty outside and a chewy inside! I also added ground cinnamon to the dough. Thanks for posting the recipe. That’s awesome! Great tip to chill the dough first. I’m so glad you liked them! Can you sub regular peanut butter in place of the powdered PB? 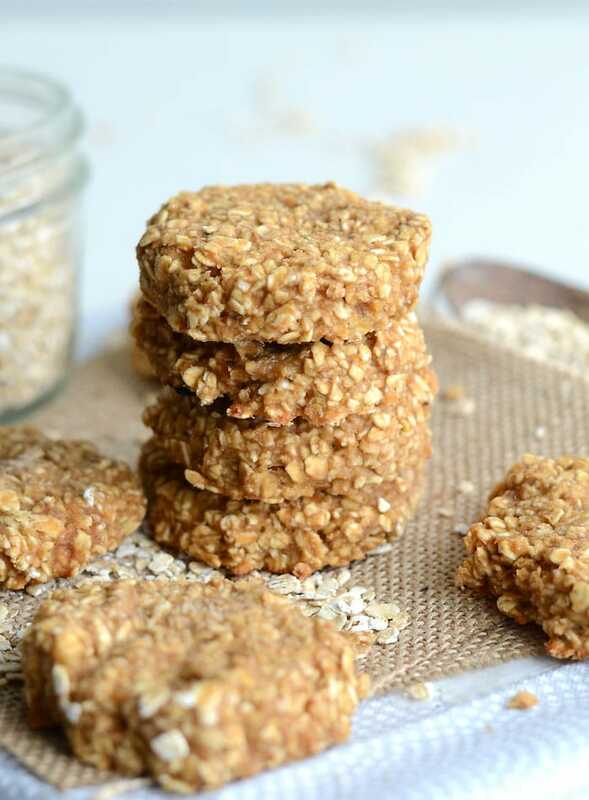 I’m not sure about that in this recipe but I’d recommend this recipe for using regular peanut butter: https://runningonrealfood.com/flourless-peanut-butter-banana-oatmeal-cookies/. Enjoy! I keep them in the fridge but they can also be frozen and they’re fine at room temp. You can make a double batch and freeze some for sure and then just thaw them in the fridge or at room temp as needed. I also like them straight from the freezer after they’ve sit for a couple minutes! Glad you’re enjoying the recipe!